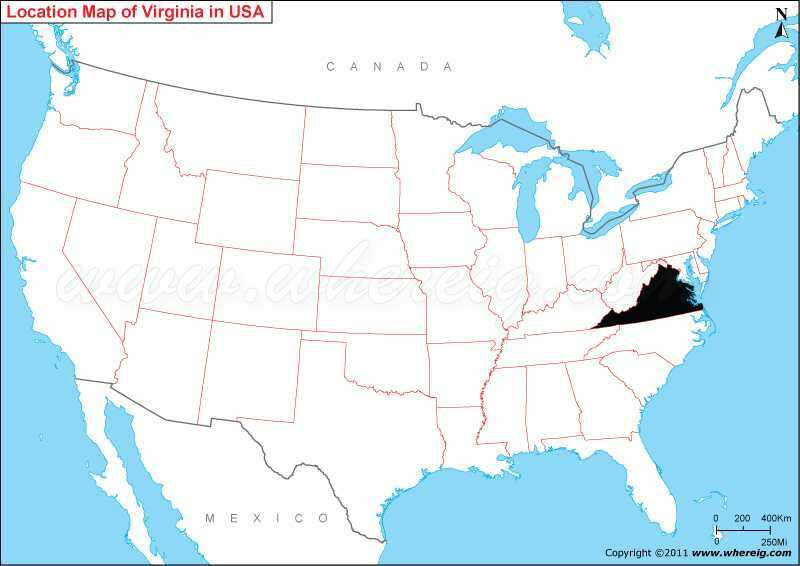 Where is Virginia located on the US map? As shown in the given Virginia location map that Virginia is located in the eastern part of United States. Virginia map also illustrates that it is the coastal state located on the western Atlantic Ocean. Hence, in the eastern side, it has the coastline along the Atlantic Ocean; however, the state shares its border with North Carolina in the south, Tennessee and Kentucky in the south-west, West Virginia in the west, and Maryland in the north. Interestingly, the nickname of Virginia is “Old Dominion” and sometimes it is also known by the name “Mother of Presidents” because surprisingly, Virginia is the birth place of 8 US Presidents. The capital city of state is Richmond; however, Virginia Beach is the most populous city and Fairfax County is the most populous political sub-division of the state. Moreover, the Virginia General Assembly is the oldest legislature in the United States. Due to its geographical location, the climate type of Virginia varies from warm to humid; the warm current Gulf Stream modifies the local weather system of Virginia.